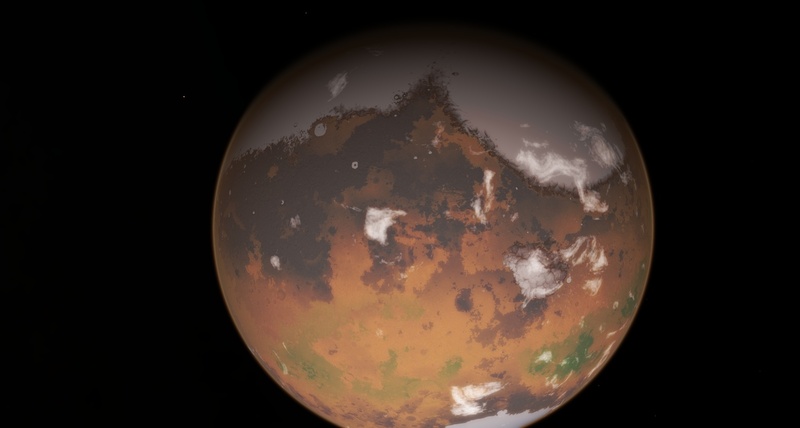 Since I just finished Kim Stanley Robinson's Green Mars, I decided to make an addon of the partially terraformed Mars from that book. 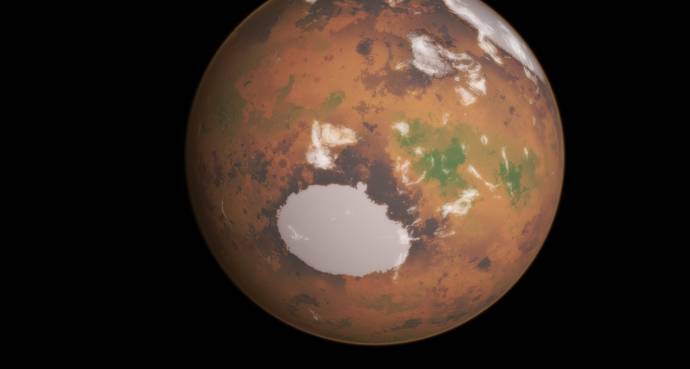 This Mars features plant life and small ice seas and glaciers. I couldn't manage to get all of the features as described in the book right, but it's close enough. 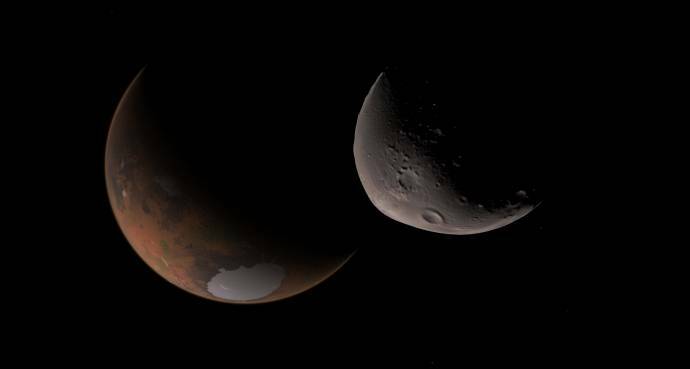 The huge glaciers in Valles Marineris flowing slowly into the Oceanus Borealis that's being formed. To the south you can also see the Argyre ice sea (much smaller than in the book, since it turns out Argyre is quite high up). The Hellas ice sea and a shallow, smaller ice sea in Syrthis Major. A better look at the shallow ice sea in Syrthis Major and the Oceanus Borealis, as well as the not yet inundated parts of Vastitas Borealis and the craters there harbouring ice. 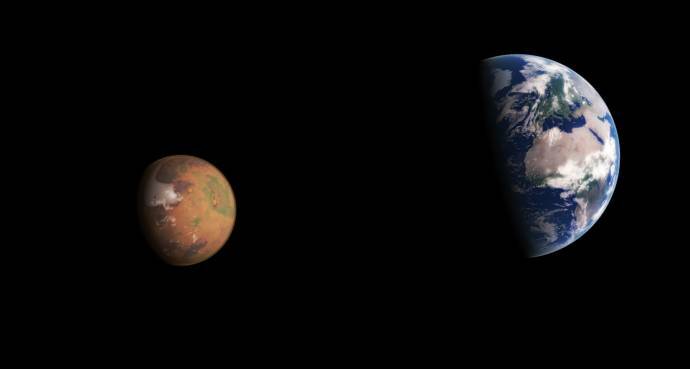 Mars and Earth seen side by side from great distance. Ohh, that looks brilliant. Great work! Neat how the volcanoes stick out from the vegetation around them. I don't read the book (it was not translated to Russian), but I'm curious: where from they get such amount of ice? What they do with atmosphere pressure? 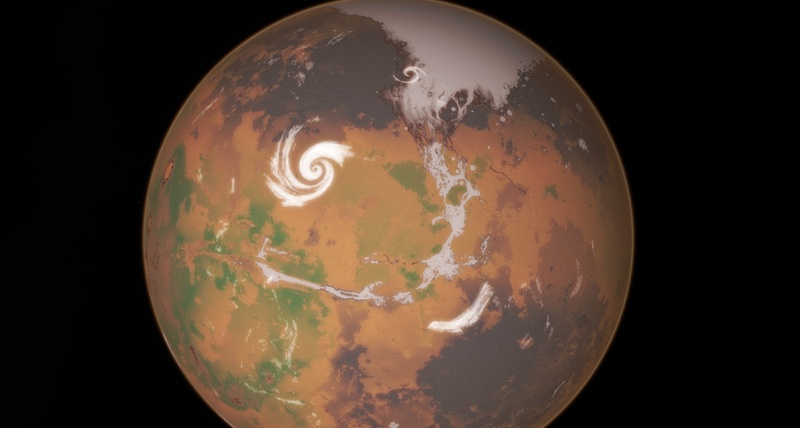 Did they crashed a big comet onto Mars? Yes, they crashed LOTS of comets into mars, burrowed huge holes (moholes) to tap into the "hot" depths of the mantle, built huge orbital mirrors (upgraded later to the soleta that was also used like a huge laser to burn the surface and release CO2 into the atmosphere), and tinkered with lots of micro organisms to modify the ground in order to make it more friendly to agriculture as the original soil had too much salts and was extremely poor. Yes, they did a lot of different things, basically all terraforming ideas combined. The ice was from underground aquifers that were pumped onto the surface which then froze. This was meant to create what would later melt into an ocean. However, Robinson might have overlooked the problem of the albedo increase that would cause. The Hellas Sea could be liquid if had salt in higher concentration. I imagine that if Mars had liquid seas, these seas would be highly salty, due to the high concentrations of minerals on the surface. dear collegues. 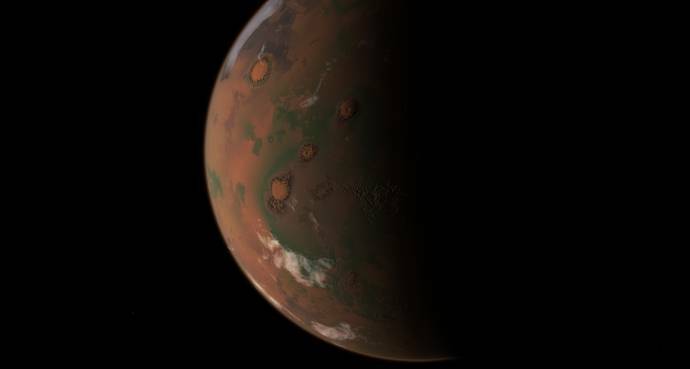 where ca i add gthis file with the terraformed mars ? how can i activate your mod ?